Apparently, my life is terrible. During a recent visit, my mother starting crying during one of our meals, as if my life saddens her. Clearly, we have different agendas. She said, "Doesn't it make you sad?" I said, "Doesn't what make me sad?" She said, "Everything...doesn't this all get to you?" 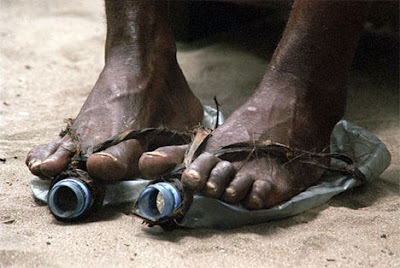 I feel like any day is a good day, if I'm not so down and out that I'm wearing flattened waterbottles strapped to my feet as shoes. Her day is bad if Starbucks messes up her latte.